Photoshop prepped? Check and double check. All systems are go– let’s make some mockups for your website! A website is made up of a few basic layouts. Generally, a website will need a distinct layout for the home page, archives, and single posts/pages. We’ll call these cornerstone layouts— your site may require other layouts, but they will generally be riffs off of the cornerstone layouts. 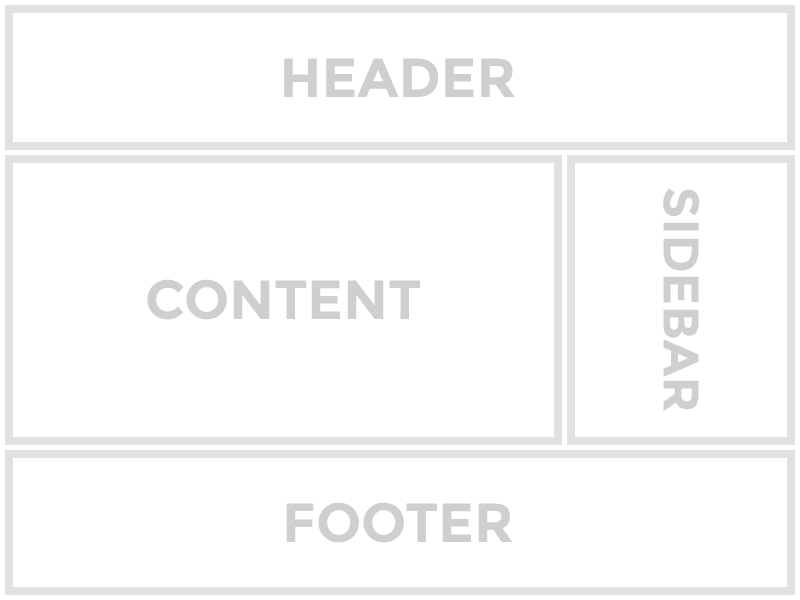 Even then, there are elements of a page that are common to all layouts, such as the header, footer, and perhaps a sidebar. This is why it doesn’t really matter which layout you start with when designing mockups. It may be worthwhile to select a layout that has a high number of common elements, but if you have a clear idea for a specific layout, then start with that one. Don’t waste time thinking about which layout to start with because you’ll ultimately be creating a mockup for each cornerstone layout anyway. If you really get stuck on where to start, choose one at random from your stack of sketches. That’s what they’re there for. For this tutorial, we’re going to start with the single post layout. It’s a fairly straightforward layout that shares the header and footer with the rest of the site. Just as with sketching, don’t focus too much on the details when you begin designing mockups for a website. You can fill in the details later. In the beginning, focus on things like structure and spacing to make sure that the layout works for its intended content. Add just enough detail to determine the design works or not. Where should the page’s title go? Should the logo be in the center or to the left? Where is the best place for the site’s navigation menu? How much spacing is needed for the article’s text to be easy to read? These are the things you should be experimenting with as you start building mockups for your site. Each mockup should be a new crack at finding an even better answer to these questions. The design may not be terribly exciting at this point, but the goal is to find a viable layout as quickly as possible. No amount of detail will fix a layout that’s broken from the start. If you’re working on a mockup and the design is not working, don’t worry about it. Just duplicate the layer group (Ctrl-J/Cmd-J) and take things in a different direction. 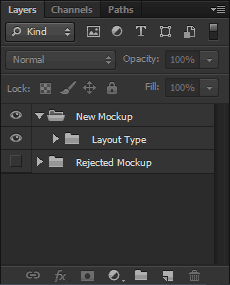 Sometimes you may feel like starting a new mockup completely from scratch. There’s no problem with that, though there are likely elements in your current layout that are worth keeping. 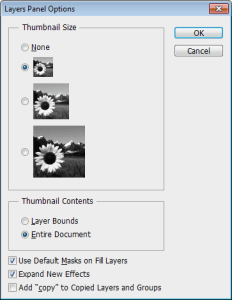 Duplicating the layer group allows you to reuse the good parts of the layout and discard the rest, saving you time and effort. 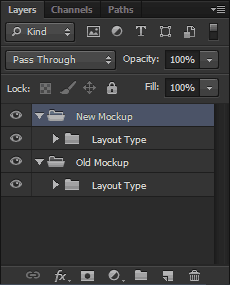 Protip: Removing the “copy” text on all duplicated layers gets old really fast. Open the layer panel’s options and disable the Add “copy” to copied layers and groups option (Photoshop CS5+). The important thing to remember is that you should never throw away a rejected design. There’s a lot of experimentation involved when building mockups and you will have designs that you’re not thrilled with. Instead of deleting your work, create a new layer group and click the eyeball next to the old one hide it. Now it’s out of sight but you still have a history of your progress, which is useful for several reasons. For example, it’s not uncommon to find that an element from an old rejected design works perfectly for a new one. It may have seemed out of place in the rejected mockup, but it fits right in with the new one. This just means that the better design was trying to get through even when you were working on that old terrible one. It’s the end of a long day of designing mockups and you can’t decide whether Emerald or Nephritis works better. In fact, as far as you’re concerned, the whole design doesn’t work. You resist the urge to trash the design completely and close up shop for the day, feeling like you wasted an entire day on bad design. But the next day, after a good night’s rest, you open Photoshop half-cringing at what you’ll see. To your surprise, you find that your designs are not half as bad as you thought they were yesterday. Yesterday you were tired and not thinking clearly, but now you see that these designs definitely have potential. Now you’re glad you didn’t give in and delete yesterday’s mockups. If you had, you never would have been able to get a second look with clearer eyes, and all your work would have been lost. Also, retaining old designs keeps you from going in circles. When you start on a new design, you can review your previous mockups to see what didn’t work so that you don’t waste time doing the same things. This way, you’ll always be moving forward. Finally, it’s just fun to look back on your old designs and see where you started and where you ended up. When you’re happy with a design, it’s time to start building mockups for the other cornerstone layouts. 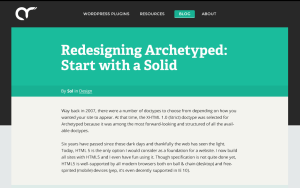 A design needs to work for the entire site, not just a single page. 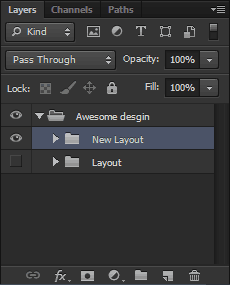 Duplicate the layer group of the layout you’ve been working on and rename it for the new layout. You may hit a few snags along the way when the design doesn’t work perfectly for another layout. This is a good thing. You don’t want to force every layouts to fit into a rigid set of constraints. Instead, the overall design should be updated across all layouts to tie them together. Remember, you’re designing a web site, not a collection of disparate pages. Sure, it may sometimes be necessary to deviate from the “global” design if a specific layout warrants it, so don’t hesitate to do so if it feels right. 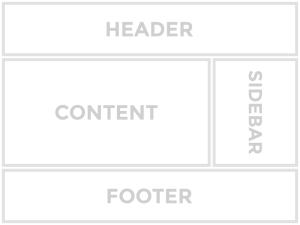 Ultimately you want each layout to have enough common elements to tie the site together. As long as you have this, don’t worry about slight variances between layouts. Once you have a design that you’re happy with and a mockup for each of your cornerstone layouts, you are ready to start adding detail. It is the details that will take your design to the next level and turn a mockup into a final polished design for your website. We’ll be discussing adding details next time, so for now, keep working on those mockups. Experiment with wild abandon and remember to have fun!